Balanced alcohol and residual marrow pairing — If the chosen accompaniment is too bitter, hot or sweet, you’ll mask the residual marrow flavor. Mid palette density — The luge experience will last upwards of 10-20 seconds. Too flat in the middle, you won’t savor your luge during the luge. Extended finish — Once you’ve luged, your friends are going to ask how it was. Did you enjoy it? Choose an alcohol without an extended finish and you’ll just be contemplating what was instead of what’s developing. OK at room temp — The bone will be warm, so chilled cocktails are out. Also, ice dilutes and who wants that? Based on these guidelines, we set out to design a Luge-worthy cocktail for the virtual cocktail party known as Mixology Monday (MxMo). The rules this time: Emphasize fortified wines such as sherry or port and presumably Chinato, vermouth, and Bonal too. 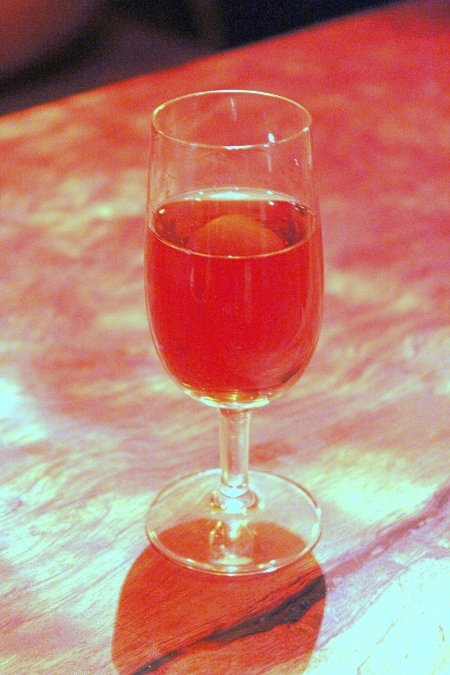 Originally, we thought to play on the salinity of a Manzanilla sherry by substituting it for a scotch in a classic cocktail such as a Rob Roy or a Bobby Burns. Manzanilla is the place-designated fino sherry from Sanlucar de Barrameda. It has an extra thick yeast cap during aging which protects it from oxidizing too early. This freshness is balanced by aging the casks in caves near the Mediterranean. As the seasons expand and contract the casks, they accept some of the sea breeze and you get the signature salinity of Islay or Campbelltown scotch. Playing with combinations, starting with the Hidalgo La Gitana (really the benchmark example of Manzanilla) as a base, we tried adding small bits of sweeter things like maraschino or late harvest wine. We quickly learned that Manzanilla is far too delicate to sub straight for Scotch. You’ll need to dial down the adjuncts considerably if you don’t want to overwhelm the sherry. Certainly cocktails like the Blood and Sand or the aggressive Black Diamond Flip were out. Build in glass** and gently stir. Luge. ** Yes, there’s no ice here. Your sherry and Bonal were refrigerated, right?! You didn’t want them to go bad and your luge is warm so there’s no need for an ice cold, diluted cocktail.